In an unprecedented nod to Filipino paint innovation, US-based company Environmental Imports, Inc. has reached an agreement with Pacific Paint (BOYSEN®) Philippines, Inc. to distribute KNOxOUT in the United States. 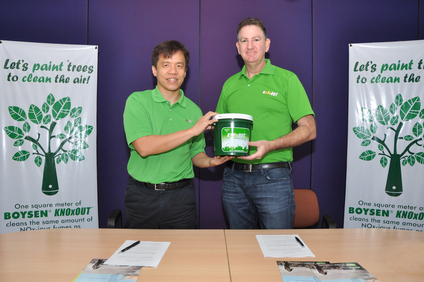 “We are thrilled to embark on this partnership with Pacific Paint (BOYSEN®) Philippines, Inc., to introduce KNOxOUT Air Cleaning Paint to the United States that will revolutionize the green movement," says Paul Rode, Chief Executive Officer for Environmental Imports, Inc., a company that imports green technologies for residential and commercial construction markets in the US. BOYSEN® KNOxOUT has made waves in the paint industry as the first air-cleaning paint in the world with CristalActiv technology for its unique ability to reduce noxious air pollutants. At the heart of CristalActiv technology is specially designed ultrafine titanium dioxide (TiO2), which has been used to reduce NOx emissions in power plants and motor vehicles for over 30 years. Cristal, the world’s leading producer of ultrafine titanium dioxide (TiO2), chose BOYSEN® to be their first partner for using CristalActiv in paint formulations. In KNOxOUT, CristalActiv uses light energy to break down nitrogen oxide (NOx) and volatile organic compounds (the two components of smog) into harmless substances through a process called photocatalysis.The process requires only light and humidity for activation, and because the air cleaning TiO2 is merely a catalyst and does not get used up in the reaction, a surface painted with KNOxOUT is able to continuously clean the air as long as the paint is on the wall. In essence, it transforms ordinary painted surfaces into air purifiers. Aside from the United States, BOYSEN® KNOxOUT has also established distribution partners in Europe, Hong Kong, Japan and Malaysia; with negotiations ongoing for other countries. Environmental Imports, Inc is proud to count KNOxOUT and its mother company Pacific Paint (BOYSEN®) Philippines in its line of environment-friendly imports from all over the world. “Their [BOYSEN®’s] mission effectively aligns with our priority of supporting environmental sustainability initiatives, and we look forward to partnering together to reverse the negative impact that noxious air pollutants have on our environment," says Rode. To date, one of the most successful initiatives of BOYSEN® for the environment is the BOYSEN® KNOxOUT Project: EDSA (Everyone Deserves Safe Air). This urban renewal initiative seeks to lessen air pollution in EDSA, which is considered to be one of the most polluted thoroughfares in the Philipines. Using BOYSEN® KNOxOUT as the medium, 8 large-scale art works (measuring 1000 sqm each) done by local and international artsts of note, are expected to purify NOx emitted by at least 8000 vehicles. 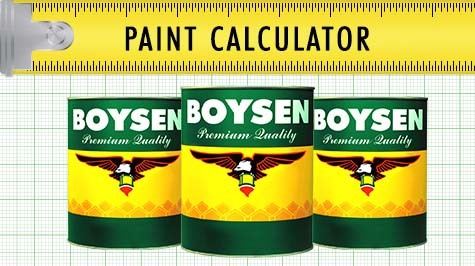 For more information about the air-cleaning paint BOYSEN® KNOxOUT, please log on to http://www.knoxoutpaints.com. For inquiries on how you and your organization can take part of a life-enhancing movement to clean the air, please email inquiry@onewalloneworld.com.